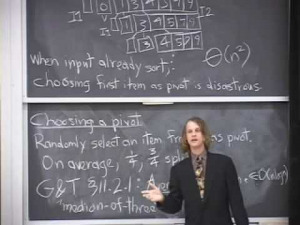 CS 61B: Data Structures - Fall 2006. Fundamental dynamic data structures, including linear lists, queues, trees, and other linked structures; arrays strings, and hash tables. Storage management. Elementary principles of software engineering. Abstract data types. Algorithms for sorting and searching. Introduction to the Java programming language. Prof. Jonathan Shewchuk discusses sorting techniques in lecture 30: "Sorting II"
MD ZUNAID wrote 7 years ago. sai kumar wrote 7 years ago. vyoma wrote 8 years ago.